IconLover 4.23 makes designing icons for Vista-style toolbars even easier by adding the ability to automatically create 'hot' versions of toolbar icons. Aha-Soft announces the release of IconLover 4.23, an update to its icon editing tool. The new release makes designing icons for Vista-style toolbars even easier by adding the ability to automatically create 'hot' versions of toolbar icons. The Circle Mask is also new to version 4.23, enhancing the appearance of round objects such as buttons. IconLover allows designers and developers to draw or edit icons easily without having to learn complex image editing tools. Supporting images of any size and color resolution, IconLover is perfectly tailored for making Vista-style icons. Producing 16 and 256-color icons, IconLover remains compatible with older versions of Windows and low-profile displays. 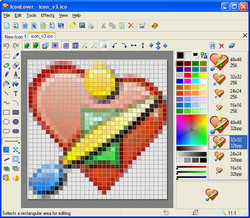 The support of 24-bit Full Color and 32-bit True Color images with alpha-channel makes icons produced by IconLover fit within Windows XP and Vista guidelines. The newest edition of IconLover makes it possible to automatically create 'hot' versions of icons. Numerous applications in Vista and XP react to user interaction by displaying a different version of an icon when the user moves the mouse cursor over it. When the mouse cursor moves over a toolbar icon, it becomes 'hot', allowing the user to easily see which item is currently active. When designing an application, it is crucially important to make the hot-tracking effect different from other effects. There are already several states available to each icons, such as normal and disabled. While disabled icons are easy to produce automatically from the 'normal' version by simply graying out and engraving the image being disabled, 'hot' icons are not as easy to convey the effect. Using a wrong type of an effect would make it more difficult for the user to navigate your product. IconLover produces 'hot' versions of icons automatically, making it possible to hand-paint a single version of an icon, and obtain the disabled, and now the 'hot' states automatically. The new Circle Mask effect introduced in this version of IconLover improves the appearance of round objects such as navigation buttons by removing jaggedness from the edges. The new effect uses semi-transparent overlay to make round objects smooth and natural, and is especially visible on smaller images. Aha-Soft, founded in 2000, specializes in creation of icons and production of icon-related software. The company owns several successful stock icon sites and created a number of popular tools icon editing, creating and managing icons. Aha-Soft provides custom design services for icons and logotypes, and offers a number of stock icons available immediately. For more information, please visit the company's site at aha-soft.com.